While simple Contact Form 7 forms are easy to build – creating complex forms & getting them to look how you want, does take some skill. It’s not that easy to get Contact From 7 forms looking like you want – particularly if you are not skilled at using both HTML and CSS. 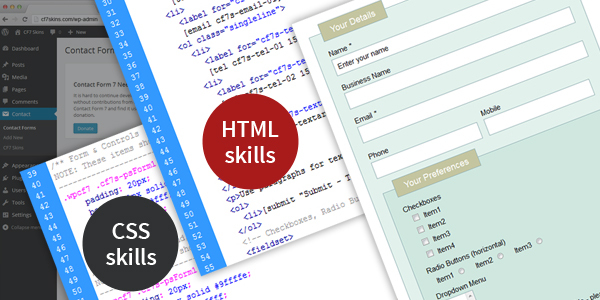 Experienced WordPress users, skilled at using HTML and CSS, are able to build & style their Contact Form 7 forms to their particular requirements … but this requires a level of skill beyond many people. 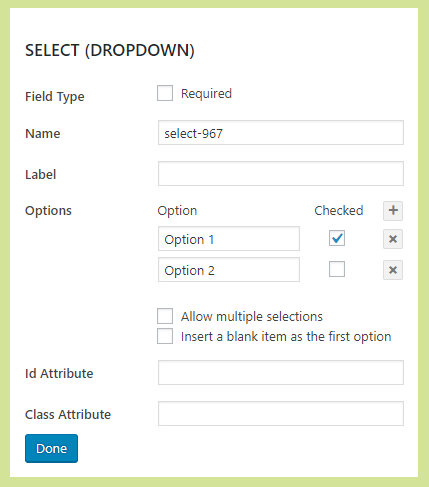 CF7 Skins provides a complete solution for your Contact Form 7 forms. 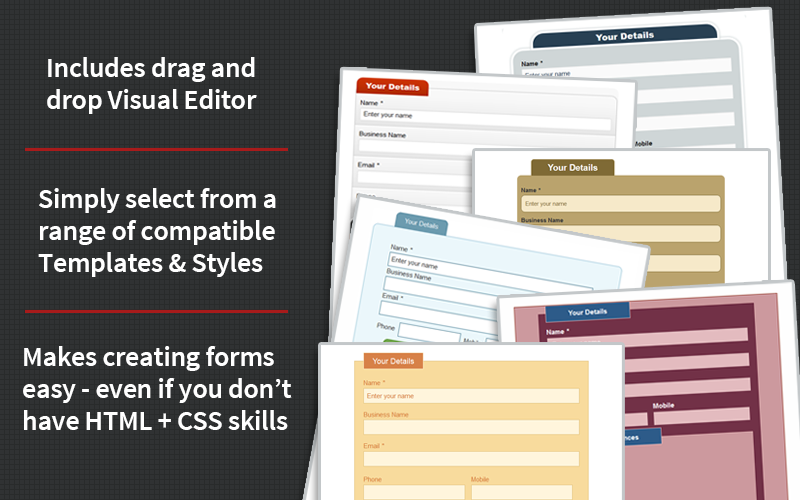 CF7 Skins makes creating & styling of Contact Form 7 forms much easier – even if you don’t have HTML + CSS skills. 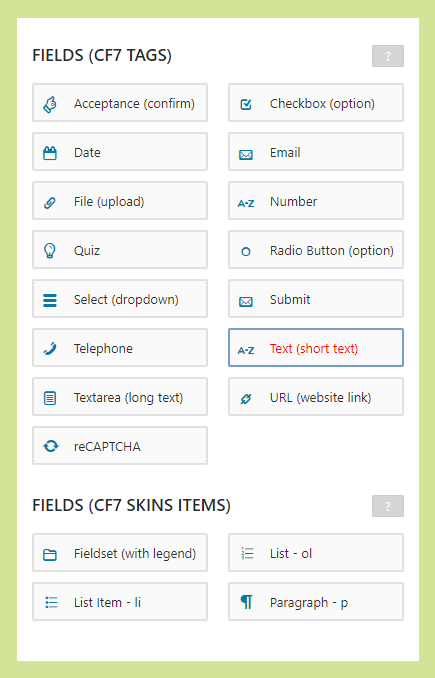 CF7 Skins extends the power of the very popular Contact Form 7 plugin. 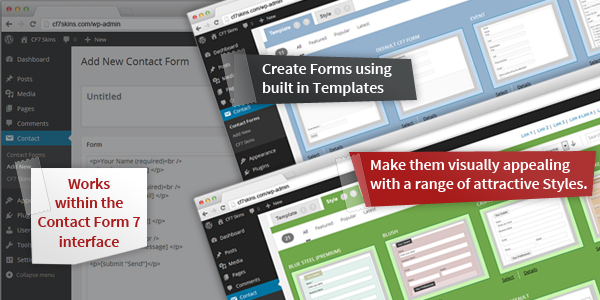 CF7 Skins makes it easier for regular WordPress users to create complex forms with an easy to use Visual Editor, built-in Templates, and a range of attractive Styles. Each Template acts as an easy to follow guide, which can be adapted to your particular requirements – right within the Contact Form 7 interface. Our Templates cover a range of commonly used forms – like User Suggestion, Customer Survey, Event Registration etc. 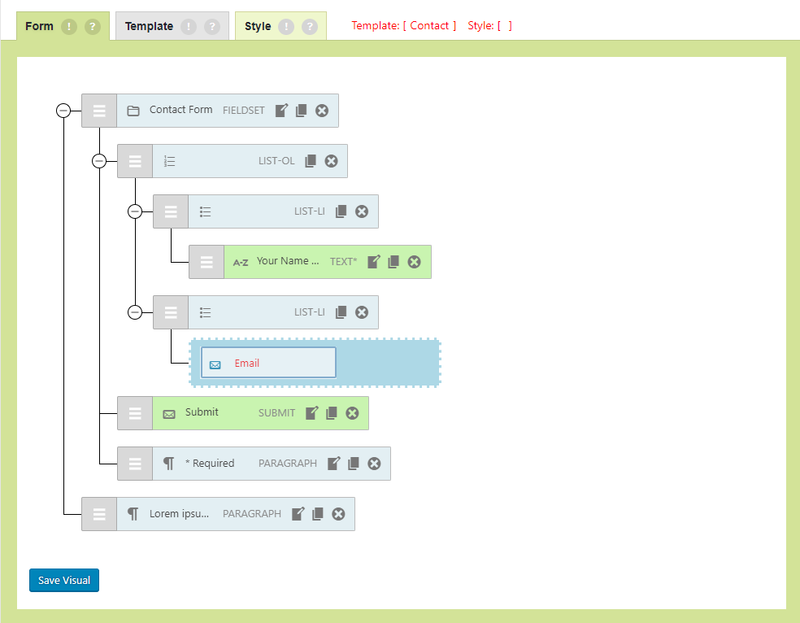 The Template acts as a starting point for your form content and layout. 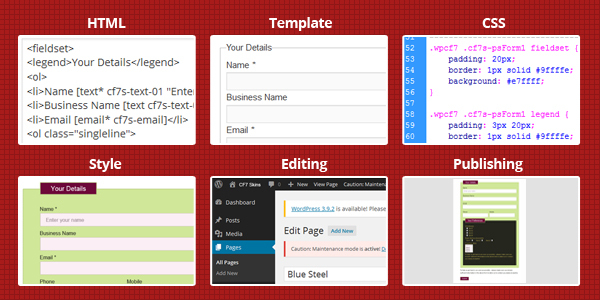 It includes the necessary HTML and Contact Form 7 Tags required to both structure and style your Contact Form 7 form. CF7 Skins provides a wide range of Styles that cover the full range of Contact Form 7 form elements. 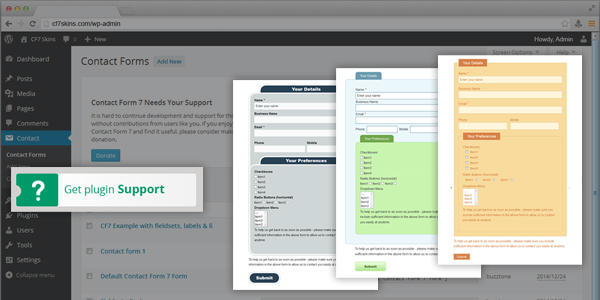 The range of compatible Styles gives you a choice of appearance for your Contact Form 7 forms. Each Style covers the full range of standard form elements available within Contact Form 7. We’ve selected a range of value-priced Bundles to meet the most common needs of our customers. You can also upgrade your license to a higher priced license option at any time and only pay the price difference from your current license. Our Knowledge Base articles cover from how to get started right up how to customize your forms with CF7 Skins. You can search it either by Categories & Tags or Keywords. 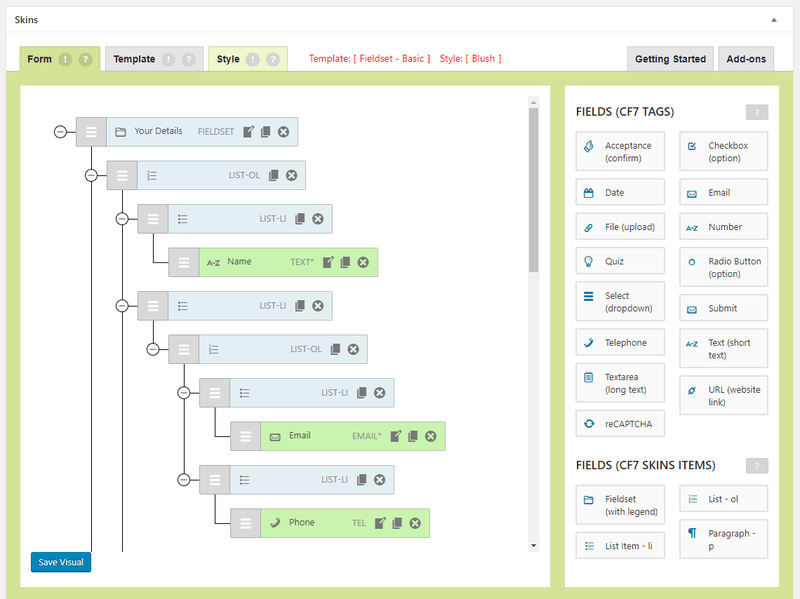 Our in-depth Documentation is a great place to find detailed answers. It covers how to get started, how to customize your forms with CF7 Skins and everything else in between. Browse over the Frequently Asked Questions from our Pro customers. Chances are your question has been asked before and it’s answered here. All Add-ons include Premium Email Support to deal with premium users questions and problems. Our premium support is easy to use – it’s all email based. For the Free Version of the plugin Community based support is offered via the WordPress.org Support Forum by other CF7 Skins users (we visit the forum intermittently to assist with plugin bugs only). Sign up to our Email List to receive regular emails about how to use both CF7 Skins and the Contact Form 7 plugin more effectively. Our articles cover issues people have when using CF7 Skins and Contact Form 7. We select suitable topics, based on questions asked in our Premium Email Support or in the for Contact Form 7 support forum.